Images of students’ demonstrations against fees are common in Southern Africa and they are important, as they are one of the tensions brought by a massive demographic change in the region. If you imagine, three young citizens from the region: Kagiso in Botswana, 20 year-old, Cecilia in Malawi, 15, and Thabo in South Africa, 22, have all something in common. They are part of the largest group population in their respective countries. There is a global youth wave that has started to flood the region and more widely the whole continent. South African youth showed how powerful they could be when in thousands they demonstrated against university fees increase in front of the Parliament and the State building in October 2015. Jacob Zuma, the SA president, announced the freeze of the fees increase as a matter of fact. 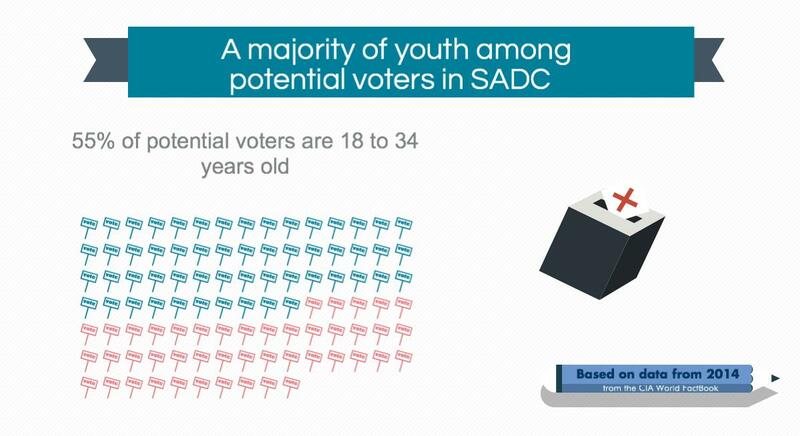 55% of citizens in age of voting in SADC region are between 18 and 34 years old. 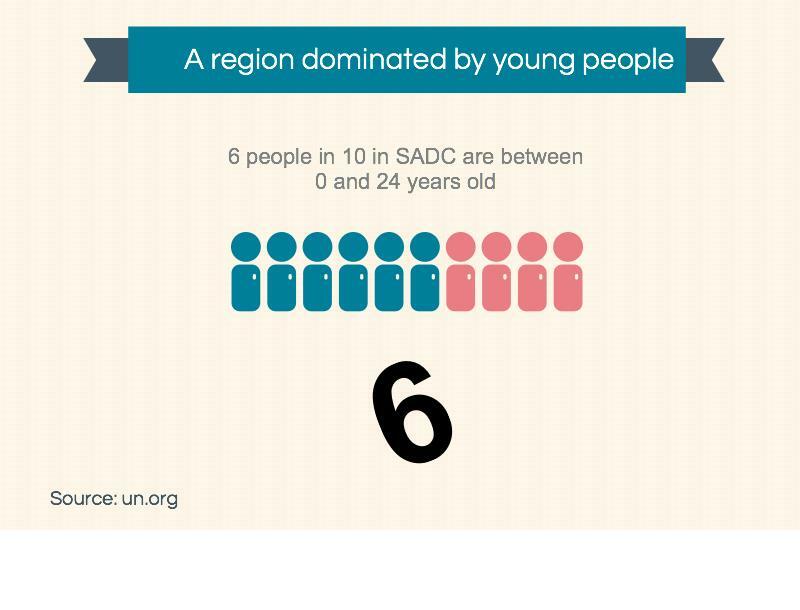 61% of SADC citizens are between 0 and 24 years old. The majority of people in this region are born after the end of the Cold War, and more and more after the end of the civil wars in Mozambique, Angola and the end of Apartheid in South Africa – there they are called “the born free”. Indian Ocean apart, the oldest population in the region is in South Africa where half of the population is below 26 years old. Many countries are even younger like Zambia where half of the inhabitants are under 17 years old! Youth is an old political concept. It has always been understood as a tool to promote change when politically controlled to fight the colonial and the white minority regimes in the region. It can also be perceived as a group that agitates for change. In 1950, Nelson Mandela became the head of the African National Congress Youth League of South Africa (ANCYL) that was founded in 1944 – already. In 1976, the youth of Soweto stood up against apartheid regime and up to this day, June 16 is remembered and celebrated across Southern Africa as a tribute to the commitment of the youth against oppression. More recently, Julius Malema has emerged politically by heading the ANCYL too. The current demographics in this part of the continent are opening a period of social tensions and opportunities. Considering youth as a minority group within a population while they are by far the majority will, obviously, be a political mistake. All ruling and opposition parties are wondering how to handle this situation and how to make the most of it to remain in power or to access it. These demographics will test political and socio-economic systems in the region. The Western world and Japan in the 1960s and more recently Arabic countries faced similar tensions. The one thing it taught us is that there is no single answer but the more solid a system is, the more stable it is. 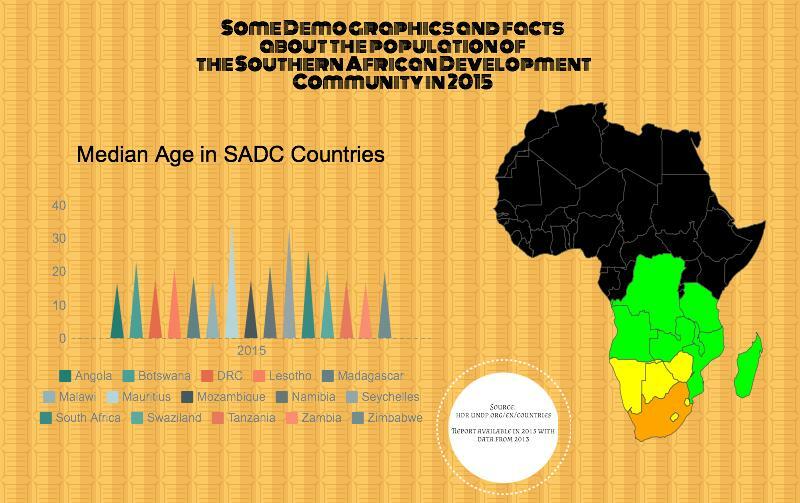 Mid-August this year, in Botswana, Heads of State of the Southern African Development Community (SADC) signed a Declaration on Youth Development and Empowerment. This is a new development showing that rulers in the region understand that demographics are changing quickly and that they need to do something about it to remain relevant. However the breadth of the change is still to be well assessed across the region. Furthermore, one can observe changes in behaviour and many societies are also evolving towards more individualistic behaviours with less appetite for the community approach and a certain respect for hierarchy. It is interesting to see many ruling parties in the region losing ground in urban centres where the youth is more present and more educated. If you check the graphs attached to this text, you can notice the Southern states and Angola have a relatively high percentage of urban population (more than 60%) while the rest of the sub-region varies from very to extremely rural like in Malawi (84% of the population live in rural areas). This would require a country-by-country study but one can assume that social structures controlled by the elders operate better in rural areas than in urban centres where competing structures are present. In any case, the best way to deal with these major demographic changes should be about embracing them. In South Africa, Angola, Botswana, Namibia, Mozambique, Tanzania and Zimbabwe, all the ruling parties are facing a similar challenge in that sector: reinventing themselves beyond the topic of the Struggle for independence and against White-minority rule to seduce the “born-free”. Obviously some disarray and disappointment is not to be excluded from the older generations that fought a tough fight to be able to rule their own countries. It must be something similar to what European parents felt in the 1960s when their kids who had many more opportunities made them understand they would not listen to them just quietly. In DRC and Angola, political youth activists not at the order of the ruling systems have been jailed without any or with little legal basis, proving a certain level of fear from the rulers. The Arab spring brings some clues about another demographic change and how different regimes resisted it. In Tunisia, the system fell but the country has remained more stable than some of its neighbours like Libya or Egypt. It could be thanks to a better flexibility and inclusiveness of the new political regime that has so far enabled Tunisia to cope better with the situation. In other countries, the system relied on a strong security system to regain control or maintain it like in Egypt and Algeria. It is also a question of internal and external factors of instability and capacity for the youth to actually be violent and the security sector to follow them or crack down on them. The political tests have already started. In Botswana last year, during the general elections and the primaries preceding them, a major generational change took place in the ballot boxes. This was confirmed in the general elections in October 2014 with a majority of MPs being below 50 – which is still considered as young in political terms. 32 out of 57 MPs were elected for the first time. This is a massive renewal of the political representatives especially as the ruling party remains the same. It is a rare combination showing as well the capacity of the ruling party in Botswana to adapt. The electoral system in that country has proved to be able to absorb the tension so far. In some countries like in Botswana the relative power of the youth in the demographics is also a consequence from HIV-AIDS as the generations between 35 and 55 are less numerous, therefore increasing the percentage of those below 25. The lines I am writing are maybe not of such news to many actors in the region. Many politicians seem to have understood the importance of the youth for their own future. Ian Khama, the Botswana President has appointed a very dynamic and very close person to him as the minister of youth: Thapelo Olopeng. Although he is in his 50s, he is a newcomer to politics and has brought a fresh and energetic style. Since the elections last year, he has been one of the most active ministers in Khama’s cabinet, launching many initiatives on youth employment. He is also very present on social media and guess which part of the population uses these media the more? The flexibility of the different regimes in Southern Africa will be tested. For regimes in the region, solidity facing this wave will come from the strength of the flexibility of a democratic system of the effective control over the security sectors. Without one or the other, it is going to be difficult. Nobody is protected from some sort of tensions and it is better to be prepared for it. There is clear divide in the Southern African region in terms of economic wealth. The countries with the biggest Gross Domestic Product (GDP) are also those with the lowest poverty rates but with high inequalities – scientifically captured by the high Gini coefficient. It is a paradox creating a fertile ground for tensions. The paradox is that the richest countries in the region are those where the youth is the most educated but face the highest levels of unemployment. In South Africa, the economic powerhouse of the region, 62% of the region GDP, one citizen in two is under 26 years old and youth unemployment is at 51.5%. No political party can ignore this factor in order to win elections but also to rule. In Madagascar, the socio-economic situation is the opposite: lower level of education, higher level of poverty but officially only 3.8% unemployment. One of the criteria that will determine the capacity to handle the demographics wave is inequality. It is about the perception of an acceptable sharing system for the pieces of the wealth cake. Another criterion is the urbanization. One has to take into account education and the economic diversification. In South Africa and Botswana, the numbers of years actually spent at school are superior to 7 years but the vast majority of SADC it is less than 7 years with the lowest being in the DRC with only 3 years. The ability of the economic system to integrate these youngsters and to provide them with jobs is fundamental. The level of expectation and potential frustration comes also from the level of education. Each generation has its own set of values and way of doing things. They can clash but they can find their own space too. Changes will happen but there should be room for everyone. The Red Cross was decried by European Baby Boomers who founded another kind of non-state actors with Doctor Without Borders in 1971. In 2015, both organisations still exist. The Red Cross has not disappeared. It has evolved. The lesson is that it is possible to accommodate everyone and that the older generations have nothing to fear. Regimes with some space for the youth, a disciplined and well controlled security force – in case of social tension turning sour – a certain level of affordable education, of job opportunities and some good governance will be in the better situation to handle the youth wave that is now flooding the region.